Domestic violence is not a distinct crime in Arizona, that is to say, there's not a specific code that defines domestic violence as a specific offense. Rather Arizona's Domestic Violence statute specifies that if certain crimes listed in the domestic violence statute are committed against a person with a close relationship to the defendant, for example, parent-child or spouses, they are designated as domestic violence offenses. For instance, if two people are in a park, and one of them assaults the other that person could be charged with the assault. If the victim of the assault is the defendant's brother the assault could be charged as a domestic violence offense. If a person is convicted of a domestic violence offense the court must order that the person complete a domestic violence offender treatment program. Disorderly conduct is a class 1 misdemeanor unless a deadly weapon or dangerous object was involved/used, and in that case, the charge is a class 6 felony. A conviction of a class 1 misdemeanor carries a range of punishment that includes 0 days to 6 months in jail, a fine up to $2,500, and up to three years probation that could include required classes or counseling. A conviction of a class 6 felony, however, carries a minimum of incarceration time along with steeper fines, and if the person has already had a felony conviction, the incarceration time increases. Compounding this broad range of possible punishment is domestic violence. Involved parties are married, formerly married, or live(d) in the same household. Involved parties have a child together. The alleged victim is pregnant with the accused person's child. The alleged victim and accused person are related by blood or law. The alleged victim is a child and lives in the same residence as the defendant. The alleged victim and defendant were or are involved romantically and/or sexually. If you are charged with disorderly conduct and one of the above conditions apply, you may be charged with domestic violence related to disorderly conduct. This means in addition to the range of penalties that accompany disorderly conduct, you could face additional consequences. One significant consequence is participation in a state-mandated counseling program. Another serious consequence is an order of protection (restraining order). These orders may order you to move out of the residence if you share it with the victim; if you are married, you must stay away from your spouse for a certain period of time; or if you have children, you could lose your visitation privileges. Other consequences are applicable depending on the circumstances of each individual case. You will want an experienced criminal defense lawyer who knows the nuances of the law and who strategizes a defense in your best interest. At Sherick & Bleier Law Office, we fight disorderly conduct charges generally and domestic violence-related disorderly conduct specifically. We analyze these cases from all angles. If there is not a complete defense to the charge, we will work to have the charge reduced or work with the prosecution for a plea agreement that benefits you. If you are charged with domestic violence-related disorderly conduct in Tucson, Arizona, it is imperative that you retain an experienced, resourceful criminal defense attorney. 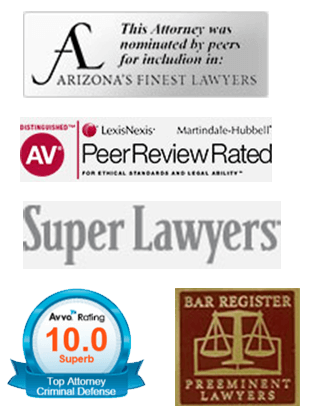 Contact Sherick and Bleier Law Office today at 520-318-3939 to schedule a consultation.